People have enjoyed warm-water immersion long before written history. In fact, many of the earliest habitation areas were established around natural hot springs, which allowed residents to take advantage of the benefits they had to offer. However, despite these facts, it is surprising that still today many people make little use of the warm-water environment for health advancement and preservation. In recent years, a considerable amount of research has gone into assessing the impact of warm-water immersion and aquatic exercise on health. For instance, warm water immersion has been found to produce a dramatic impact on the human autonomic nervous system (ANS) (i.e. involuntary nervous system), the component of the central nervous system that controls cardiovascular and gastrointestinal function, blood flow and distribution, muscle tone and even a great deal of brain activity. The ANS has two components: the sympathetic system and the parasympathetic system. This system creates what is commonly termed the ‘flight’ or ‘fight’ mechanism. It is evoked during fear and prepares the body for combat and stress by raising blood pressure and heart rate, increasing muscle tone, and facilitating intense brain focus on the causes of that fear—be it a rattlesnake or an enemy combatant. It is also part of the central nervous system (CNS) that is in constant overload during post-traumatic stress disorder (PTSD). This system becomes dominant during states of relaxation, which facilitates digestion, lowers heart rates and blood pressure, and allows the brain to engage in a wide range of creative thought. Warm water immersion causes a dramatic down regulation of the sympathetic system, allowing the two autonomic components to come into balance. Various studies have shown a significant, positive autonomic effect during warm water immersion in both young and older individuals. The noted effects are parallel to the findings seen during meditation and after a period of quiet relaxation. 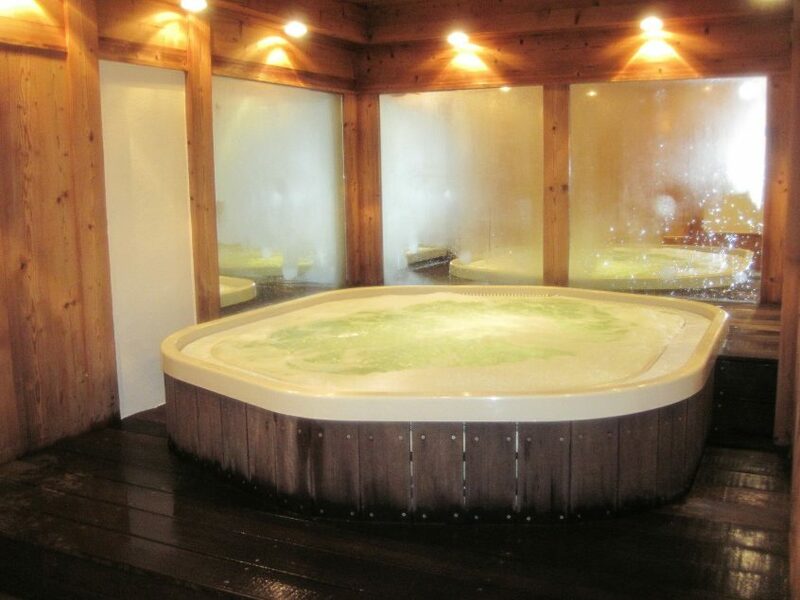 Warm water immersion has also shown to reduce anxiety. During this relaxed state, the brain is disengaged from momentary concerns and stresses. Memory functions improve, free-associative linkages are increased, which then facilitates creative thought processes. In fact, Winston Churchill was known to take long, hot baths on a daily basis. These baths had to be kept at a particular temperature and were measured by a thermometer. He was also known to dictate and take meetings from the bathtub. It is believed that his creativity was due in part to the warm water immersion. Immersion in water of any temperature produces buoyancy, which serves to off-load joints, reduce loads on the spine and intervertebral discs, and increase peripheral circulation as well as reducing the heart rate. 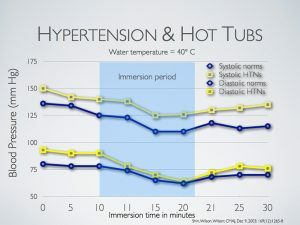 However, the unique effects of warm water add to the feeling of relaxation and well-being with a typical reduction in pain, if present, and a further significant decrease in blood pressure. These effects can be beneficial in healthy people and very valuable to those suffering from health problems, such as heart disease, arthritis, anxiety disorders and depression. During warm-water immersion, heart rate and blood pressure typically drop, peripheral circulation increases, and the efficiency of the cardiovascular system improves. During warm water immersion, heart rate and blood pressure typically drop, peripheral circulation increases, and the efficiency of thecardiovascular system improves. These effects have been translated into a number of studies of individuals with heart disease, showing the significant benefits of both simple immersion and aquatic exercise performed in a warm water environment for these populations. 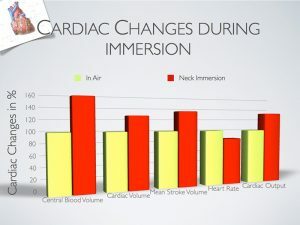 During warm-water immersion cardiac function improves because the heart does not have to exert as much force to circulate blood throughout the body. Cardiac function improves because the heart does not have to exert as much force to circulate blood throughout the body thanks to reduced vascular resistance and a slower heart rate. In fact, several studies conducted to assess the impact of warm water exercise—based on a frequency of three times per week—showed a lasting benefit. It is unfortunate this is so poorly recognized within the health care industry, because if it were, overall public health would improve and healthcare costs would likely be reduced. Another common, well-researched public health issue is arthritis. For centuries, warm water immersion has been used for the management of both acute and chronic joint pain. A number of studies conducted in the last 50 years have shown positive effects on both arthritic pain and function through warm water aquatic exercise, while the benefits of simple, static warm-water immersion have received less attention. Simple immersion produces hydrostatic pressure on the body, which is the driving force to decrease joint swelling—both in acute arthritis as well as in post-operative joints—particularly in the knees, ankles and hips. As a result, this can facilitate pain reduction and increase joint movement. Immersion also produces buoyancy, which off-loads weight from joints and further reduces pain to enable the performance of strengthening exercises. This, in turn, helps to improve balance, co-ordination, endurance and overall quality of life. In fact, as a result of these combined benefits, many studies of individuals with arthritis have shown sustained improvements in pain levels, gains in functional abilities, and improvements in mood and self-confidence. While not a joint-specific problem, fibromyalgia is categorized within the same category as arthritic diseases. The actual cause of this disorder remains unknown and, for some, the available drug therapies can be problematic, resulting in significant side effects. As a result, this leaves fibromyalgia patients with limited options for treatment. Similar to the benefits of warm-water immersion for arthritis sufferers, a substantial number of studies performed on patients with fibromyalgia have shown warm-water exercise as well as simple immersion to be beneficial for muscle pain, strength, endurance, and overall health. It is quite safe to say no other medical intervention currently available for fibromyalgia offers such substantial benefits with so few side effects or such little risk. While the benefits of aquatic therapy have been recognized since prehistoric times, it is surprising there has been so little established within modern-day society, general medical practice, and research funding opportunities. Unfortunately, for both general public health and the economic value of the industry, it is far easier to find federal funding for complex medical technology than for aquatic health benefits. While knowledge of the value of warm-water immersion is emerging, the level of public recognition remains low. To change this, the industry needs to work aggressively to improve public awareness by using science, the media, and being proactive. This article was written by Bruce E. Becker, MD and originally appeared on Pool & Spa Marketing [link].